Next month, the first phase of a new solar plant will open in Morocco—and when it’s finished, it will cover an area even larger than the country’s capital city of Rabat. 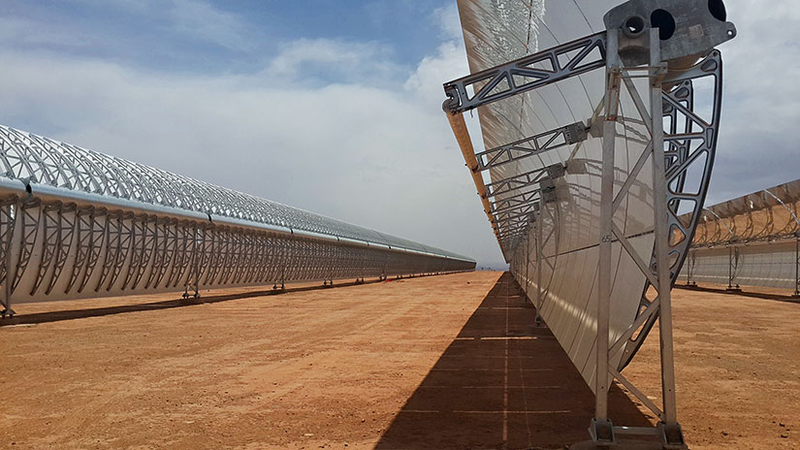 The Guardian has published a fascinating feature on the development of the first stage of the solar power plant at Ouarzazate, known as Noor 1. It will contain 500,000 crescent-shaped solar mirrors that follow the sun during the day to capture sunlight. The mirrors are all 12m high and focus on heating up a steel pipeline carrying a “synthetic thermal oil solution” - which can be heated to 393 centigrade and mixed with water to create steam and turn the turbines to make electricity. Apparently by 2020, it should mean that renewables provide half of the country’s energy needs — when complete Noor 1, along wth Noor 2 and 3 (which are due to open in 2017) will generate 580MW of power — enough for a million homes. The project will be welcome not just for environmental reasons, but for security reasons too. Apparently the motivation behind the $9bn project isn’t climate change, but the fact that Morocco currently imports the overwhelming majority of its energy needs as fossil fuels from abroad. It’s an exciting sounding project, and if successful could mean the rest of the world starts taking solar more seriously. You can read the full feature here. Image by World Finance Project.